Info & pics sent by Roland Gaebler (sailing above) . Good to see Flyer yard getting up to date after years of being leaders in the A-Class. 3,30mts wide though might be too much of a platform for single handed? 2,30mts A-Class in current restricted rules scenario can achieve good stable foiling (if sailing hours are invested) , and even more easier if you insert from below say a TNZ/FP J foil. The As are becoming more efficient each day maintaining their 75kg overall and slim beam. Michele Petrucci reports 90kg sailors doing well in the super efficient 'Mini' foiler Stunt 9, check video here. The goal of the Flyer though is Lake sailing in light winds thus the added sail power and size. "New project by Flyer Catamarans Aicher+Egner in Bavaria, purely made for single handed foiling. Flyer Catamarans won 7 World Titles in AClass with Nils , Glenn and many other Titles. This Company building Acats for more than more than 30 years. Now they come back with new concepts. They are one of the most innovative boatbuilder you can imagine. 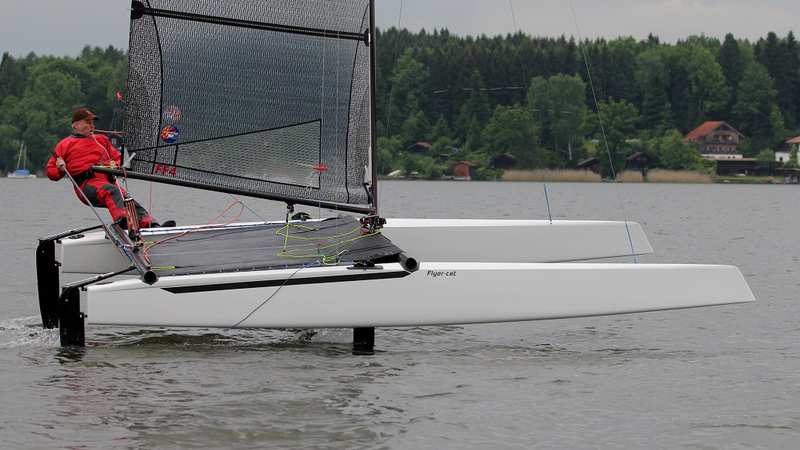 this boat gets also an Code Z and Jib Option to be a rocket at light wind races in Alp area. And you can use straight boards as alternative. Their foils are very thin and small to avoid drag. It is a complete new concept. Both foils in the water have less resistance than an normal foil. This means, you can also be ultrafast in drag-mode in light winds. They have asymmetric profiles and no rake. Once you have found the balance, you fix the screw and go sailing. The foils are Ultra light and also a bit flexible. More details later"